Posted July 22nd, 2008 by Kevin Buckstiegel & filed under Uncategorized. Estelle’s legacy will live on and on through the comedy and laughter she gave to us all, which will forever keep us laughing out loud. Posted June 17th, 2008 by Kevin Buckstiegel & filed under News. 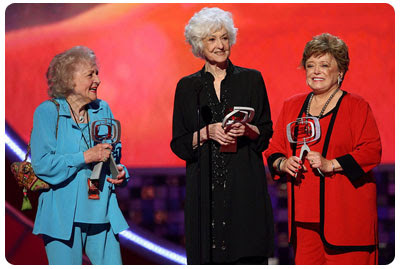 Hope you had the chance to see the TV Land Awards! From what I hear and have seen on the internet, Bea looked great! Unfortunally, my Tivo didn’t record the show twice now, so I still haven’t seen it! Hopefully, this Thursday, all will go smoothly! Quick update on this site. To cut down on cost, I’m back to hosting this site on my own server and am going through some backend changes. You may come across some broken links in the meantime. I’m most likely aware of this, so be patient and check back a little later, as I will be fixing these as quickly as possible. More updates will occur over time. So, I basically just wanted to let you know what is going on with this site. As usual we will still available at www.beatricearthur.com, but the files will now be downloaded from my own www.lgt2.com, which is also going to be going under major changes. Just makes it easier for me! Take care and come back again, as I always hope to be posting good news for fellow Bea fans! Posted May 24th, 2008 by Kevin Buckstiegel & filed under News. The show will tape on Sunday, June 8 at The Barker Hangar in Santa Monica, CA and will premiere on TV Land on Sunday, June 15 at 9 p.m. ET/PT. This award is presented to a show that has crossed the line from television series to pop culture phenomenon. Posted May 13th, 2008 by Kevin Buckstiegel & filed under News. Today is the big day! Happy birthday to Bea! 86 is the new 29, so don’t stop now! Posted April 17th, 2008 by Kevin Buckstiegel & filed under News. Bea Arthur along with Larry Gelbart, Merv Griffin. Daniel Burke, Tom Murphy, and Sherwood Schwartz have been chosen as the latest inductees into the Academy of Television Arts & Sciences’ Hall of Fame. The Hall of Fame “is a special recognition for those who have made significant contributions and have left an indelible mark on the television business,” ATAS chairman and CEO John Shaffner said. Hall of fame candidates are submitted from the academy’s membership and the industry at large to the selection committee, which votes on the final decision. The group will be honored at a ceremony to be announced at a later date. Posted November 14th, 2007 by Kevin Buckstiegel & filed under News. TV LAND joins ENTERTAINMENT WEEKLY to present The 50 Greatest TV Icons. “From the people who brought you the 100 Most Memorable TV Moments, 100 Most Unexpected TV Moments, and the 100 Greatest TV Quotes and Catchphrases. Posted August 11th, 2007 by Kevin Buckstiegel & filed under News. Just wanted to remind you that Bea’s appearance on TVLand’s Back to the Grind will air this Wednesday! We’ve been talking about it for quite a while now, the previews look great, so now is your chance to see it in its entirety for the first time! She played a tutor on the “Golden Girls,” but now, Bea Arthur takes on one of the greatest roles of her illustrious career…teaching and tutoring college SAT prep classes for real! Then, “St Elsewhere’s” Ed Begley Jr. recreates his TV job by working at St Joseph’s hospital for a day—with tasks ranging from manning the information booth to serving lunches to his biggest fear—taking blood. Posted June 16th, 2007 by Kevin Buckstiegel & filed under News. Now available in crisp, clean, digital quality… the imfamous Vera can be in your hot hands on DVD Tuesday, June 19th! Order HERE or run yourself over to your favorite store and pick up your copy! A definite must have for any Bea fan… even though Bea herself didn’t love the movie… doesn’t mean that we can’t! This is another ‘about !@*$#@! time!!! !’ DVD release!Kev! Posted June 5th, 2007 by Kevin Buckstiegel & filed under News. This half-hour series takes iconic TV performers — from Loni Anderson to Harry Anderson and other actors not named “Anderson” — and has them perform the real-life version of the jobs their characters held on Classic TV shows like WKRP in Cincinnati and Night Court. Other performers featured include Erik Estrada, Marla Gibbs, Sherman Hemsley, Betty White, Mark Curry, Bea Arthur, Ed Begley Jr. and Jimmie “J.J.” Walker. UPDATE :: http://www.tvland.com/originals/backtothegrind/ The episode where Bea will appear will air August 15th! Posted May 13th, 2007 by Kevin Buckstiegel & filed under News. Today is the big day! Happy birthday to Bea and happy mother’s day to her and everyone else!